In the center of historic Bruges this old hospital became a charming B&B. The guesthouse SintNik, ideally located in the historic center of Bruges, in a quiet street just a stone's throw from the Belfry and the Market Square. This magnificent house, once a hospital during the years 1900, combines character and elegance, charm of the past and contemporary comfort. Your host Julie will be happy to welcome you all year around. SintNik B&B allows you to discover all the ‘must-see’ sights of Bruges by foot. The guesthouse SintNik, ideally located in the historic center of Bruges, in a quiet street just a stone’s throw from the Belfry and the Market Square. This magnificent house, once a hospital during the 19th century, combines character and elegance, charm of the past and contemporary comfort. Your host Julie will be happy to welcome you all year round. 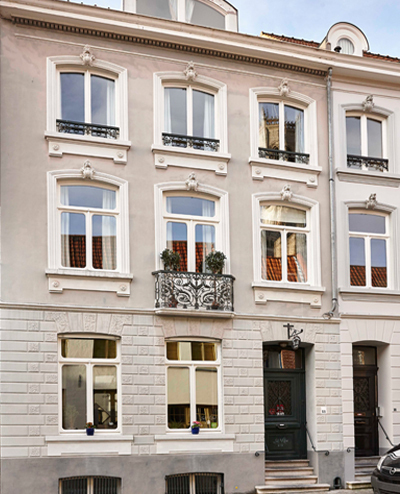 SintNik B&B allows you to discover all the ‘must-see’ sights of Bruges by foot. This lovely house has been completely restored but has kept its authentic character and the charm of a typical old house of Bruges. SintNik B&B shelters 3 big luxury rooms. Each room has its own private bathroom. There is a public car park named Zilverpand at 300 meters, which is only a 5 minutes walk from the B&B. The hearty breakfast is served by Julie in the living and dining room located on the ground floor. In summer you can also eat outside on the patio. The breakfast consists of an assortment of rolls, breads and pastries, a selection of local cheeses and cold cuts, cereals, yogurts, fresh seasonal fruit salad, daily made fresh orange juice, coffee or tea.